Packwood House, with its showcase gardens, is a splendid Tudor House which has gone full circle from being thoroughly modernized over the centuries to being restored to its Tudor grandeur by its 20th century owners. 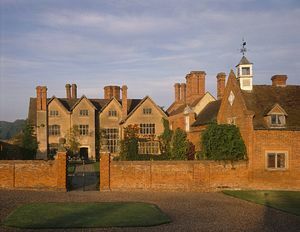 Packwood House was built in the late 16th century for John Fetherston, a prosperous Warwickshire farmer. The tall Tudor chimneys remain, although the half-timbered structure has gradually been filled in with brick and rendered over. The adjacent brick stable-block was added by a later member of the family in the 1670s. just nine years later Charles II was given food and drink to aid his escape after his defeat at Worcester in 1651. The Fetherston family eventually died out in the late 19th century, and the house passed through a number of hands, being allowed to deteriorate further before being bought by industrialist, Alfred Ash, in 1905. He and more especially his son, Graham Baron Ash, invested their family wealth in the restoration of the house and gardens, removing Georgian and Victorian alternations and reinstalling leaded casements, old beams and chimney pieces salvaged from other old buildings. 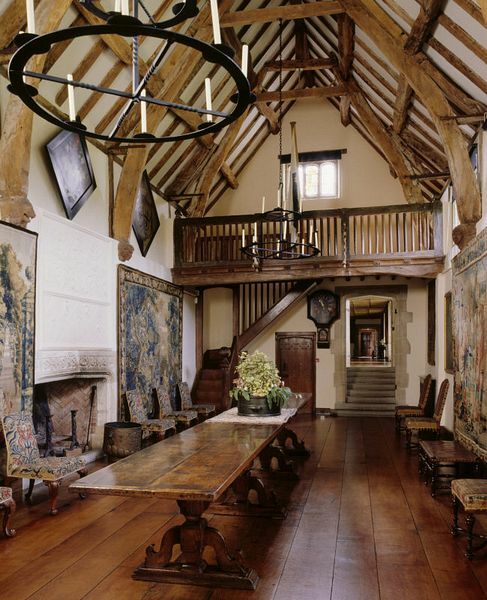 Graham Ash was an avid connoisseur and collector, filling the house with exquisite Brussels tapestries, Jacobean panelling, oak cupboards and the long refectory table still seen in the house today. To get a true feel for this impressive property, walk down the Long Gallery, added in 1931, to the Great Hall. The Hall amply demonstrates the wonderful work he did, creating it from a former barn and utilizing the hayrack to make the balustraded gallery. 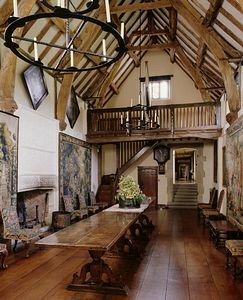 He filled the space from polished floorboards to rustic rafters with beautiful 16th century tapestries and period furnishings. Cleaning the whole contents piece by piece takes The National Trust volunteers and professional restorers three years to complete! Although the house is a real delight, the 102-acre gardens are even more breathtaking. 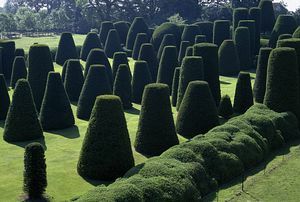 Across the manicured lawn, brick steps lead to the famous topiary garden, where the extensive clipped yews are said to represent the Sermon on the Mount. On a mound is a single great yew, the "Master"; 12 more yews representing Jesus' disciples are lined up below with "the multitude" being the scattering of trees further below. The yews take a great deal of time to keep them in shape, even with the help of a hydraulic lift and modern-day power tools! The sunken garden, laid out with its herbaceous borders in the 17th century, has four corner brick gazebos, one of which has a fireplace designed to warm the wall for the espaliered fruit trees. Looking back at the house and the collection of red brick buildings, one curious thing to note is the number of timepieces which decorate these old buildings. Clocks, sundials and bell-towers seem to be almost an obsession of the former owners. There is a small shop on-site, but the best catering facilities are at the nearby National Trust property of Baddesley Clinton, which can also be enjoyed on a discounted ticket allowing entry to both properties. Johnsons of Henley X20 Birmingham–Stratford-upon-Avon, alight Hockley Heath, 1 mile. 2 miles east of Hockley Heath (on A3400), 11 miles south east of central Birmingham. Lapworth 1 miles; Birmingham International 8 miles.